FG to launch intervention for refugees, IDPs – Royal Times of Nigeria. The Federal Government says it would unveil a National Integrated framework for Refugees, Migrants and Internally Displaced Persons (IDP) in September. The Acting President, Prof. Yemi Osinbajo disclosed this during the commemoration of the 2017 World Refugees Day on Tuesday in Abuja. He said that the new approach would be a shift from relief dependent measures to real and measurable durable solution strategies. He said that the National Integrated Strategic Framework of intervention is a demonstration of commitments of the Nigerian government towards more responsive, radical and creative approach to providing durable solutions for displaced persons. “Our responsibility is to provide a more coordinated and harmonized approach to the Nigerian Humanitarian environment that guarantees that future which they hope for because no one becomes seeks refuge of becomes displaced by choice. “Working with all key humanitarian stakeholders, the National Commission for Refugees Migrants and IDPs shall unveil a National Integrated Strategic Framework for Intervention for Refugees, Migrants and IDPs within the next three months. “I wish to express my gratitude to the government of Cameroon, Chad and Niger who hosted and are still hosting Nigerian refugees at the time the insurgents were ravaging. “This show of solidarity is what we need to survive and confront whatever challenges that we encounter both as a region and as individual nations,’’ Osinbajo said. 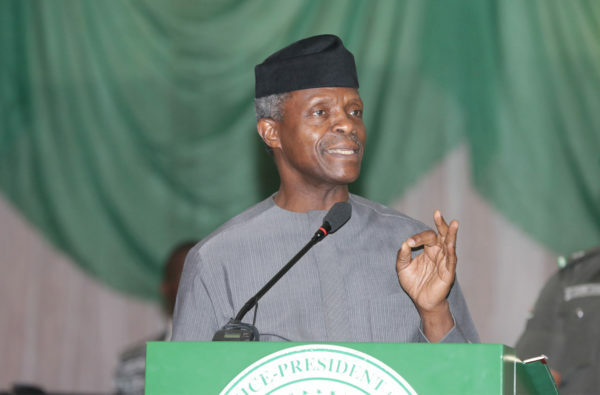 Osinbajo said that Nigeria was committed to the smooth implementation of the tripartite agreement with Cameroon and the United Nations High Commissioner for Refugees (UNHCR) on the voluntary repatriation of Nigerian Refugees in Cameroon. He appreciated UNHCR, other UN agencies, International and Civil Society Organisations for their support and the Military for a successful operation which has contributed to the willingness of displaced persons to return home. In her remarks, Hajiya Sadiya Farouq, Federal Commissioner, NCFRMI said that the World Refugee day is set aside to reflect on the challenges faced by the displaced and how to help to positively shape their future. She said that a survey by the International Committee of the Red Cross and Red Crescent reveals that global migration has reached unprecedented dimensions with 60 million people currently displaced globally. She said that as a result of the Boko Haram Insurgency, about 180,000 Nigerians living as refugees in Cameroon, Niger and Chad and 1409 refugees from other countries with 614 asylum seekers currently in Nigeria. Farouq said that the new framework contains approach that will effectively and efficiently cater for refugees who seek safety, solace and care in Nigeria. She stressed the need for better coordination between the Federal and State Government in terventions and the inclusion of organized private sector to amplify and enhance the humanitarian response as it pertains to refugees. Also speaking, Mr Jose-Canhandula, UNHCR Country Representative to Nigeria said that Nigeria is a case in point as the third largest humanitarian crises globally. He said that as protection agency, UNHCR has availed itself to joining the government and concerned partners to foster the protection of the people in the condition of refugees and IDPs. Speaking on behalf of the refugees, Mr Germaine Ukumu said the World Refugees day was important to them as it celebrate the resilience of millions of people who have been forced to flee their countries for safety. She appreciated the Nigerian government for its hospitality and support to alleviating their sufferings. Ukumu said they are still faced with the challenges of adequate food, education, security and human dignity which they deserve better. The News Agency of Nigeria (NAN) reports that the 2017 World Refugee Day was with the theme “We stand together #with refugees and IDPs and was organized by the NCFRMI, UNHCR and the ECOWAS Commission.